Can’t find what you are looking for or have more questions? Contact me and I will get you more information. Shaklee is the number one natural nutrition and green cleaning company in the United States. For over 50 years we have been helping people feel their healthiest and providing an opportunity for financial freedom for distributors. By using our products, you make a real difference on your health, your home and your wallet. 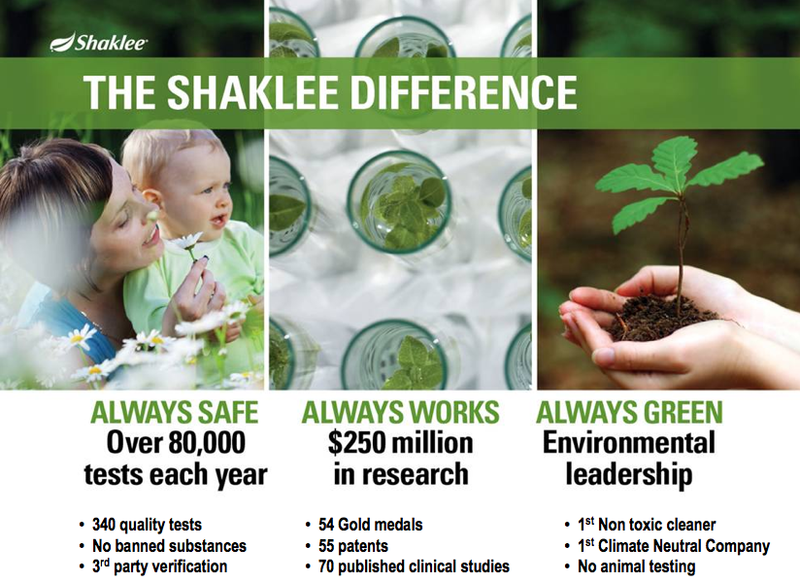 All of Shaklee’s products have been tested to make sure that they are always safe, always work and are always green. With Shaklee’s commitment to our planet, they created the first biodegradable bottles for their cleaning products and have completely offset their CO2 emissions. To boot, they became the first Climate Neutral company in the United States. Shaklee not only loves their planet but also the creatures who inhabit this earth. For that reason, they are sure to be free of any animal testing . With such a great track record of business etiquette, environmental stewardship and top of the line products, Shaklee has received an A+ rating by the Better Business Bureau. Shaklee cares about the products they put out there. This is why they spend over $250 million investing in clinical testing, research, and development. They have run over 80,000 annual test for product quality and have over 100 scientific papers, 90 of which are published in peer-reviewed journals. Striving to only use the purest natural ingredients in their products, Shaklee has strict measures in place to keep out pesticides, contaminants and other yucky things. Beginning in 1915,visionary Dr. Forrest C. Shaklee created Vitalized Minerals, one of the first multivitamin supplement in the world. We are excited that in 2015, we get to happily celebrate a legacy of 100 years of product innovation! Growing up on a farm in Iowa instilled in Dr. Shaklee the importance of environmental stewardship and the amazing benefits that nature has to offer. What set Dr. Shaklee apart from his colleagues is that he did not follow the tides by focusing on treating illnesses but instead, focused his time and energy of preventing illness from the very beginning. With this mindset, Dr. Shaklee focused his research on multivitamins. Throughout his life, Dr. Shaklee has been a leader in health and has laid the foundation for the Shaklee legacy that you know and can trust. He believed strongly that nature has amazing healing powers that can be respectfully harnessed to help people. Today, the Shaklee organization is spearheaded by CEO, Roger Barnett. Roger joined Shaklee after successfully leading large companies to success both nationally and internationally. This Yale and Harvard graduate has helped move our organization forward. Not only is Roger a strong and stable leader but he also cares a lot about this business and it’s ability to help people and the planet. That is why Roger has paired up with Wangari Maathai, a Nobel Prize winner to help reforest parts of Kenya, Canada and the United Sates. For his efforts and the work that he has done, Roger was selected by the World Economic Forum as a Global Leader for Tomorrow. That’s the kind of guy I like to have by my side! Goal to plant a million trees. Sponsoring three North Pole expeditions to measure the impact we are having on global warming. When Jacques Cousteau set out on his research vessels, we donated our environmentally friendly cleaning supplies to help mop the decks. Shaklee distributors also get a chance to give back by sending donations of vitamins and nutrition drinks to children in need across the global, as well as providing these materials to victims of natural disasters. Whenever someone purchases a Shaklee Gold PAK, they plant enough new trees to offset the shipping of this product. You can join Shaklee from many different places around the world. As a Business Leader, this can provide you with the opportunity to run an international business. Have friends in Mexico or planning to go on vacation to Japan? You have the opportunity to continue to make new connections and grow. Learn more about The Gold Ambassador Program. Interested in starting an international Shaklee business? Reach out. Thanks to the internet I am only a click away! Shaklee let’s you decide how you would like to participate in the Shaklee Effect. You can participate as a consumer or you can share the products you love and turn it into an income generator. USE . SHARE . BUILD. What I love so much about having my own Shaklee business is that I get to spend more time with my family, especially our daughter. I don’t have to worry about glass ceilings, salary gaps or gender disparity. I have the opportunity to grow as much as I want and arrange my priorities to best fit the life I want to live. And guess what? I’m loving it! Getting started is easy and many people are jumping on board. On average, 12,000 new entrepreneurs join each month. Join us! Since Dr. Shaklee created one of the first multi-vitamins in 1915, called “Vitalized Minerals,” Dr. Shaklee continued to pioneer highly effective, safe nutritional supplements. Dr. Shaklee decided to devote his efforts to nutritional research, focusing on good health rather than on sick patients. Back then, he created a small product line to help patients with the health problems they were experiencing. But after opening the doors of Shaklee Corporation in 1956, he and his team of scientists have worked to create the best natural health products available in the U.S. Since Dr. Shaklee’s passing in 1986, Shaklee Corporation continues his philosophy of researching and developing the best natural products to improve health, therefore becoming the #1 Natural Nutrition company in the U.S.
A recent landmark study by UC Berkeley School of Public Health determined that consumers who take Shaklee supplements had markedly better health than people who took either no supplements or another brand of multi-vitamins and other supplements. Educate yourself about Shaklee products. Try them for yourself. We guarantee that you will feel the difference in your health. You will be more energetic, have better complexion and be…happier. Your whole family can benefit from Shaklee products at any stage of life, from baby to grandparent. It’s time to live a healthier life! We are most well known for their organic home cleaners and supplements but they also carry a line of beauty and weight loss products. They have come out with pioneering products such as MindWorks which helps with memory function, Vitalized Immunity and Vivix which to help slow cellular aging. It is important to have a strong healthy base of the nutrients you need to live a healthy and active life. That’s why, these healthy foundation products are key as they provide the essential vitamins, protein and supplements, to give your body the nutritional foundation it needs. We believe so much in our products that we guarantee you will feel better in 30 days of using our products—or your money back. Home should be the safest place on earth. Let us help you keep it that way by using products that are safe, powerful, and green. The best things about our home cleaning products is that due to their concentrated formula and smart packaging, you will not only save money but you will be purchasing products that are better for the planet than the leading competitors. Having joint pain, memory loss or low energy? We have you covered for that and more with their Health Solution products. Shaklee 180°® is clinically tested products* and a program that helps you lose the weight and learn how to keep it off. Powered by Leucine® to help you retain muscle and lose fat. Best part, I think they taste great! Taking care of your body is not just about what you put in it but also what you put on it! Our skin and hair care line has you covered from the inside out. For more, check out our virtual catalog! Where Can I Buy Shaklee Products? Great news! You are in the right place. At Kern Wellness, we pride our selves in excellent service and helping get you the products you need. How Shaklee works is through independent business owners like myself who are so in love with that products that we want to them with people who are looking for a healthy and green solution. If you have specific questions or need assistance looking for a product you can contact me directly. If you want to browse around and see what we have to offer please be sure to check out my personal site. Shaklee products will not be found on a shelf in a store but you can find them right here. Through a real person, like me! Dr. Shaklee believed that the best way to share the message of health and wellness comes from real people who have used the products and can share with others how they work. Shaklee believes in rewarding those who have benefited from the products and invests in people like you and me to share the products with people who we know and care about. These two ladies (stay-at-home moms) had a mutual friend who posted on Facebook about using Shaklee, and became friends in the comments on their friend’s Facebook posts. What a story! They both used cloth diapers for their kids, but Amber’s girl was experiencing water eyes, runny noses and other allergic reactions to her laundry detergent. After switching to the Get Clean laundry detergent, her daughter’s symptoms began clearing up…and they developed a new friendship! They both continue to share Shaklee with their friends and family and are growing their family’s income as a result. Ellie is an environmental pioneer who helped the company plant a million trees for our 50th anniversary. She helped spark an international effort to plant 14.2 billion trees around the world. She had passion and commitment that went far beyond her own business. I had the pleasure of meeting Rick a few times out in Colorado. Once a rocket scientist, Rick jumped into his business 100%. He used to not like speaking with or in front of people but has learned these skills as he grew as a leader. Robin was born into a legacy of health and wellness thanks to her grandmother. With a generational business that this company provides, women like Robin have the opportunity to continue on a legacy for her children and grand children. Your work never stops giving and can be passed down from family member to family member. Want to Discover Your Own Shaklee Story? Contact me below and let’s talk. The only way things will change is if you take a chance. Take a chance with Shaklee. Maybe it will be you telling your story in a video like these one day!